Owners will get to take their Honda and Acura vehicles back to dealerships once again. 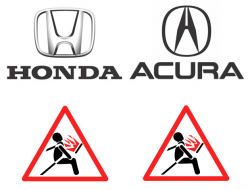 March 12, 2019 — Honda is recalling more than 1.1 million Honda and Acura vehicles that were previously recalled, or the airbags were used as replacements to prevent the inflators from exploding. The vehicles were originally recalled to replace the driver's side frontal Takata airbag inflators with different Takata inflators that contained a desiccant to keep the chemical propellant dry. The chemical, ammonium nitrate, can become unstable when exposed to heat and moisture over time. Honda believed replacing the non-desiccated airbag inflators with desiccated inflators would solve the problem with ruptured inflators. But the crash of a 2004 Honda Odyssey altered that perception when the desiccated inflator exploded and injured the driver's arm. The automaker opened an investigation and determined manufacturing errors occurred at a Takata plant in Mexico where the inflators were exposed to excessive moisture. This can cause overpressurized airbag deployments that send metal debris into the vehicle cabins and the occupants. Honda says affected customers will be mailed recall notices April 17, 2019, but Honda and Acura dealerships already have the required replacement parts in stock. Owners shouldn't wait to contact their Honda and Acura dealers to schedule appointments to have the driver-side inflators replaced. Free rental cars are available in the event replacement airbag inflators or airbag modules are temporarily unavailable. Honda owners with questions or concerns should call 888-234-2138 and ask about recall number O41. Acura owners may call the automaker at 888-234-2138 and ask for information about recall number U40.